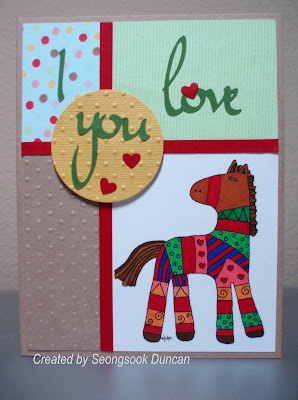 WOW you really carried the patterns from the pony throughout your card layout, LOVE IT!! Such a colorful guy! Thanks for playing along with us this week at TMITA/PCC and hope you can come back and play along again next week! What a darling card! It is so colorful, and I LOVE the way you have divided your background! I am so glad that you joined us at TMITA/PCC this week, and hope to see you back next week! What a fabulous use of the layout, I love all the colors and how the pony brings it all together! Thanks so much for being Unscripted with us this week, hope you play again soon! The pony is adorable! Love the colors you chose. Thanks for playing along with us at Unscripted! How cute! This layout works so well with this image and I love all your embossing! Your sentiment is done beautifully! Thanks for joining in with us at TMITA this week! OMGosh Seongsook.... I don't like it I LOVE it! I love your layout,embossing, coloring and paper! You rock GF! Thanks so much for playing along with us at TMITA! I love all of the elements of your card! the colors, the layers the textures- everything! oh how sweet that this is for Patti, how nice is that?! You card just comes together soo nicely with the background and the pony and of couse who would love that senitment!! just beautiful! Thanks for playing along with our challenge this week over at TMITA/PCC! Hope to see you next week! I'm sure Patti will love this. Your card is very pretty. Love the bright colors. Thanks for joining us in the TMITA/PCC challenge. WOW that pony image is too fun! You rocked our Sketch this week with a great card.